You would have thought reading all the fuss around the tube strike and the Chelsea/Arsenal games that this was something new. For those of us who like our football a bit more “rural”, the issue of lack of public transport on Boxing Day has always been a spectre. The fixture computer had been a bit cruel this season for Lewes, seeing us playing away on Non League Day, Bonfire Night (THE night of the year in Lewes) and New Years Eve (The last night of the year spent in the company of the Met Police isn’t that appealing I am sure you will agree). 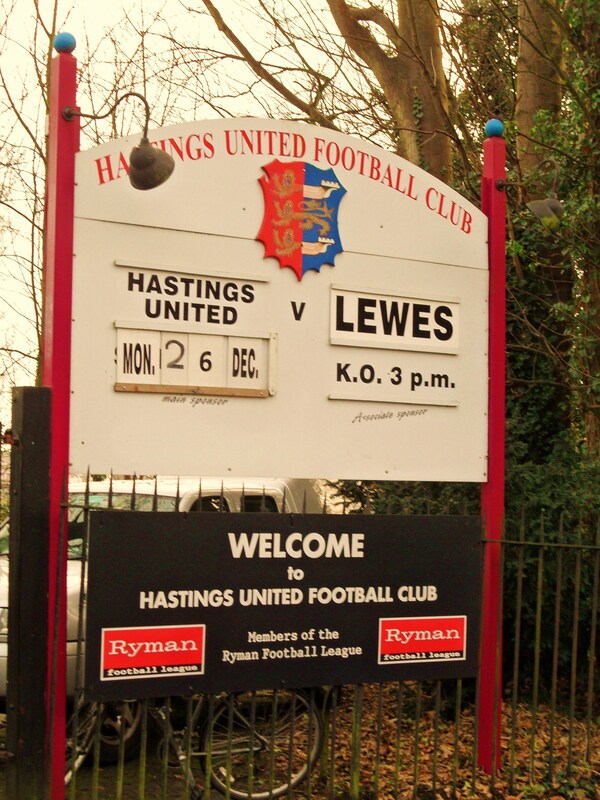 But Boxing Day has seen us drawn to play along the coast at Hastings United, “The Arrows”. Whilst not in the same league as the rivalry with Eastbourne Borough, it was still the game at this level between two teams from East Sussex. You would expect this to be a bumper crowd. Lewes, with an ever growing away support, playing just twenty miles to the east in Hastings, or “God’s overflow waiting room”. Hastings, where Harold lost his eye and subsequently the English throne forever. Hastings, birthplace of such distinguished world figures as Andy Bell (of Erasure fame), Harry H Corbett (of Steptoe and Son fame), My namesake Simon Fuller (of S Club 7, Spice Girls fame) and Graham McPherson (of Suggs fame). 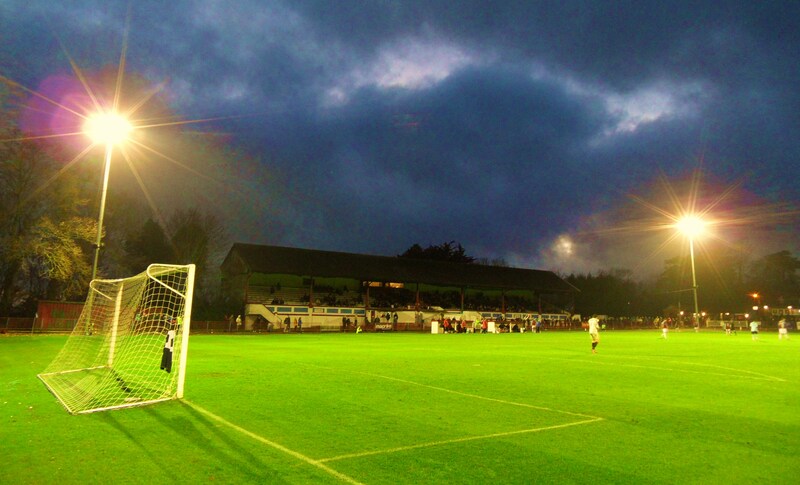 Hastings, home of The Pilot Field. Who wouldn’t want to miss this one? High flying Lewes, unbeaten away from The Pan for over a month, against a Hastings side that has struggle to find consistency this season. A mouth-watering derby, and a chance to blow away the Christmas Day cobwebs. Just a short hop on a Southern train. Except it wasn’t. Southern decided that they didn’t want to run any trains on Boxing Day, and buses between the two towns are almost non-existent, so literally hundreds of fans would not be able to get to the game. Did we expect anything different? Not really – after all it is ONLY Non League football. I was OK as I was driving anyway. 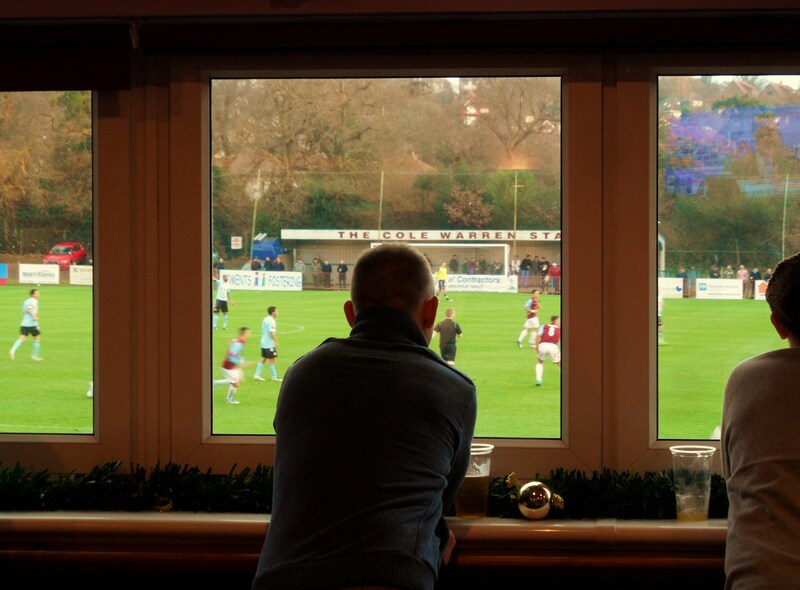 The Lewes FC chauffeur driven directors car was picking me up from home and taking me straight to the Executive Entrance in Hastings (OK – my Dad was driving) and for me this would be a visit to a new ground which simply doubled the excitement to fever pitched level. Boxing Day football has always been very kind to me. I’ve seen some absolute crackers down the years and it has long been a Fuller Family tradition that we all go to a game on Boxing Day. Despite the fact I also try to sandwich in another half a dozen games before the New Year I was unlikely to break the tradition as it has been handed over from father to son and now to daughter as Lolly came along decked out in Hollister and Ralph Lauren. The kids of today eh! In my day it would have been a Y-Cardigan and a pair of stay-press Farah’s. None of this US-branded stuff malarkey. Have you been into a Hollister shop? Do they not pay their electricity bills or something? Or is it a ploy so that you don’t know what you are buying. Anyway, teenage clothing rant over, let’s get on with some action. Lewes came into the game on the back of a “hot streak” of away form. Five consecutive away wins sort of hot streak, and with Hastings not exactly enjoying life at the wonderful Pilot Field, my money was going on a Rooks win. Of course, as Mr Marber reminded me, I cannot actually put money on the game. As a director of Lewes it is one of the things I have to remember not to do, along with singing along to “sack the board” and not passing brown envelopes stuffed full of cash to strange men in dark overcoats. We arrived in good time in Hastings and caught a glimpse of Pilot Field through the trees on the way down the hill. It was clear that this would be a big crowd for the Arrows, in fact as it would prove, the biggest crowd of the season by some distance (689 if you must know). The ground lived up to its reputation as one of the finest traditional arenas in the Non Leagues. Once home to greyhound and speedway racing, the ground sits on the edge of a natural hill. The old grass bank that once allowed the capacity to be over 10,000 cannot be used anymore but the large Lewes following behind the goal made a huge amount of noise in the cavernous stand as the teams walked out onto the pitch. 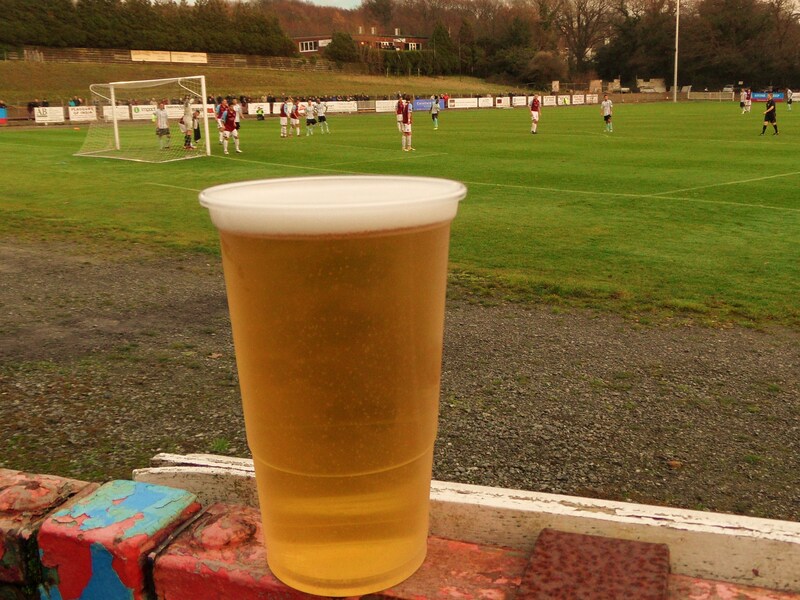 There was just time to grab a pint of Harveys, provided by Lewes FC, in the bar before the Rooks kicked off, looking to put pressure on Lowestoft in third place. Hastings United 0 Lewes 1 – The Pilot Field – Monday 26th December 2011 With players even falling foul of the lack of public transport, Lewes started with one of the most experienced benches they have had this season with both leading goalscorers sitting out the opening period of the game. Replacement striker Ian Draycott nearly opened the scoring in the first few minutes but his shot was well saved by the Hastings keeper. With Jarrett and Nanetti both seeing lots of the ball it was a very positive Rooks team that dominated the first half. Despite not being able to create many chances of their own Lewes simply did not looked troubled at the back. Perhaps this is due to the settled back four, who have started over 70% of the games together this season. Familiarity breeds solid defensive robustness, as the saying goes. Harding, one of the most impressive players in the last month came the nearest to breaking the deadlock when his header somehow managed to hit the post and stay out with half time approaching. The Lewes fans were undoubtably the stars of the first half, raising the roof on the covered terrace. With the Non League tradition of swapping ends at half time, the Rooks fans found themselves almost on top of the action, willing the ball into the net. We nearly had our wish on the hour mark when substitute Michael Malcolm headed the ball into the net but was harshly ruled offside. With just ten minutes to go, Hasting’s midfielder Attwood received his second yellow card in just a few minutes and he became the victim of another refereeing decision in Lewes’s favour in the past few weeks. The Rooks sensed victory and both Nanetti and Jarrett stuck to their wings, creating havoc with the full backs. With just five minutes to play, Jarrett beat his man again, sent in a deep cross that was then hit back into the area and in a carbon copy of Trevor Brooking’s 1980 FA Cup winning goal, Malcolm stooped to head the ball home. Such was the relief from the players that Harry Harding ran to the crowd and was embraced by the Rooks fans as if he was Santa Claus himself. Lewes saw out the final few minutes with some comfort and for a brief few minutes whilst we waited for the Lowestoft score to come in, rose to second in the league for the first time in three months. Captain Steve Robinson came over and shook hands with it seemed the whole away support. Six out of six away from home demands respect and that is what the team have from the fans at the moment. On days like today football overcame the inefficiencies of our public transport system and a bumper holiday crowd enjoyed a game free of the poison of the professional game. More pictures from the Christmas extravagansa can be seen here.